What’s my excuse this time for being late with the essay on the book of the month for my Goodreads group? Here is a new one for me: I could not decide between two essay topics on William Gibson’s Neuromancer, so I wrote two essays. And yes, I grant that neither of them is fabulously ground-breaking, but both topics nagged at me until I agreed to write them down, so here we are. While William Gibson’s writing uses jarring sensory impressions and culture clash to make the reader feel dislocated, the whole plot centres around a split artificial intelligence trying to integrate its shards into true sentience. Perhaps the most immediately notable feature of Gibson’s style is his use of flashes of information, world-wide cultural references, and staccato rhythm. Throughout the book, Gibson brings dualities into the narrative: mind and senses, reasoning and intuition, brain-and-body, cowboy and street samurai, software and hardware, simstim and matrix inputs, culture and technology, individuality and connection, the struggle to tether the new to the old. We are periodically reminded that Henry Dorsett Case and other Matrix runners elevate the brain and disdain “the meat,” but Case is actually just as much meat as brain: he has a drug dependence, he is subject to blackmail thanks to the mycotoxin he has been poisoned with, he gets distracted by sexual pursuits, etc. The dangerous heist he has been hired for (or blackmailed into) relies on Case alternating between the sensory input he receives from Molly’s simstim rig and the virtual construct of the Matrix. Molly herself, though a deadly street samurai and a physically dominating presence, is not just meat but is also brain: she is very independent-minded and always has her own plans. In fact she pretty much sets Case in his path and keeps him there. From the start, she has her own agenda and second-guesses their employer, Armitage (a.k.a. Corto). The unfolding plot introduces us to the nascent artificial intelligences Wintermute and Neuromancer, with their complicated and far-reaching schemes. Through small touches like so many Impressionist paintbrush strokes, Gibson portrays Wintermute as Knowledge and Neuromancer as Feeling. Wintermute (cold, silent?) 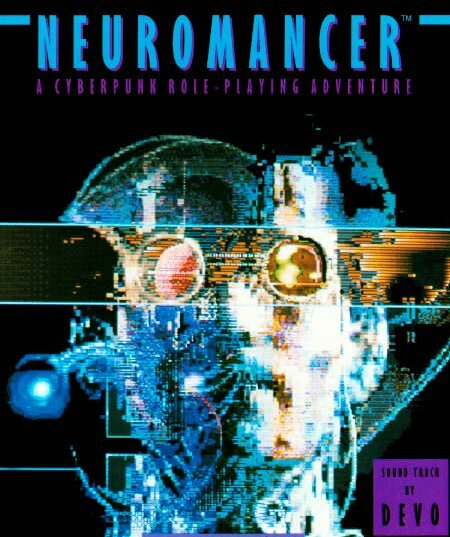 is repeatedly associated with information and reasoning, particularly because of his slow, complex plans; while Neuromancer (new, emotional?) is associated with music, beauty, emotional needs, particularly because of his use of Linda Lee and other people Case knows in a simulated environment. To manipulate Case, the AI Wintermute emphasizes the alienness of the Tessier-Ashpool clan, their wasp-like behaviour, and yet they collect mementos of humanity, the finest in arts and crafts and history, showing a certain search for roots despite their aspirations to create something new. And Dixie Flatline, who is now a potentially immortal disembodied simulation, refuses to be mind only and asks Case to destroy the Construct. In the end, no one is just meat or just brain, just emotions or just reasoning, just sensation or just logic. In order to become truly sentient, the AIs have to integrate their dual aspects as well. Posted on July 3, 2013 July 27, 2013 by mechanteanemonePosted in books, fictionTagged books, cyberpunk, fiction, neuromancer, scifi, william gibson, writing.